Designers are trying to experiment on elements so as to make it more creative. They are rather combined in an interesting manner so as to bring out new layouts in the coming years. Designers have already tried out this split screen layout where the screen is divided vertically so that two things with equal importance can be represented simultaneously. The next most important trend in the field is flat and material design. For an untrained eye there is no much difference between a flat and a material design. A flat design as the name specifies is devoid of any three dimensional elements as it tries to imitate the real world circumstances. Material design on the other hand is a little bit exaggerated, colorful and it satisfies the needs of those users who are more attuned to digital interactions. Moreover it also creates a design ecosystem that the customers become more familiar with across many products and devices. Typography is the heart and soul of any design and communication. Flexible and responsive typography which works well with any device is therefore very important in website design. It should be well managed and displayed in such a manner that the text is visible well whether it is on a cell phone or on a computer monitor. Since web is universal the typography practiced on your site too should be universal.Ecommerce Website developers are applying such flexible and responsive designs to adapt themselves to this ever changing sea of devices. Electronic gadgets with a trendy and responsive layout is a prerequisite for any ecommerce website which makes your customers snap back to your site repeatedly. It has become an incredible popular pattern. People always require things at their disposal and the fact that these responsive websites provides them the facility to access their websites from anywhere allows its increased usage. Moreover people hesitate to carry their laptops everywhere they go. Therefore making your website responsive is a crucial factor for your success any business. This is also a technique of Responsive Design. It makes the site clean and functional. Certain menus are to be kept hidden until they are required. The visitor can view such menus only if they click on the corresponding icon. They would normally be seen on the mobile view of a site but some online sellers use this even when their site is viewed on a laptop or desktop even. Parallax websites are one of the recent trends in web design now. It can always be a designer’s best choice if he wants to impress his client or if he needs to implement a sudden impact on his site. A drawback with this design is that it easily takes away your visitors attention and therefore should be implemented carefully. Care must be made to highlight your actual content –i.e. your product. The background effects also creates a different feel among the viewers. On whatever grounds it may be the website always looks appealing. Videos are one of the most powerful and efficient tools for communication. It enables you to convey a clear picture of whatever is meant be it a product, brand or service. For the same reason classy, imaginative and professional videos are being increasingly used in webdesign.It really plays a good role in the success of your business as your customers feel interested and they eagerly wait for your new videos. This shift towards videos will definitely bring you a higher return on investments. On web animations have become smoother and lighter and thereby their popularity also augmented. Websites with contents that can swirl, tilt, flip, bounce will provide your viewers with a delightful experience. Web animations were once considered nugatory but with the advancement in technology designers have recognized its importance and its advantages. Therefore animations make applications more enjoyable and engaging. Galleries and slideshows have now become an inevitable part of any website and they enrich your sites without overburdening the users. The important reason behind their popularity is that they create a lively feel throughout and moreover they keep the users always live and alert. They present the site information in a rigid and organized manner. In short they show the universality of the site in a more energetic and attractive way. To conclude 2015 is going to be a new world for Ecommerce. Taking into consideration the whole spectrum of possibilities that it can offer and keeping in mind about these prominent web designing trends we can completely change our traditional idea about web design which provides it with a new dimension. Rather than overcrowding your site with outflowing information it is always good to know and try out these simple and attractive designs. 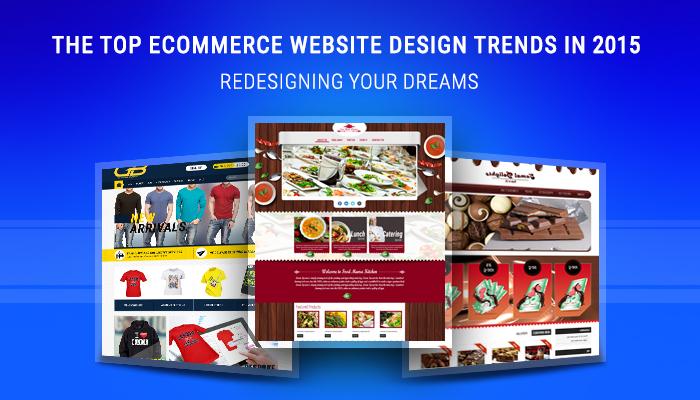 SMARTECHPRO TECHNOLOGIES will be updating the forthcoming ecommerce design trends for you. Remember to follow us through Facebook, Twitter, Google+, LinkedIn and our Blog.